VICE-PRESIDENT Emmerson Mnangagwa has denied accusations he played an active role in the Gukurahundi massacres, which reportedly claimed over 20 000 lives in Matabeleland and Midlands regions in the 1980s. Speaking in a recent interview with United Kingdom-based magazine New States Man, Mnangagwa said reports linking him to the atrocities were being peddled by his political foes to soil his image. Mnangagwa, who at the time was State Security minister, seemed to pass the buck to President Robert Mugabe, then Defence minister Sydney Sekeramayi and army commanders for the massacres, which were perpetrated by a North Korean-trained army unit, the Fifth Brigade.Speaking in a recent interview with United Kingdom-based magazine New States Man, Mnangagwa said reports linking him to the atrocities were being peddled by his political foes to soil his image. 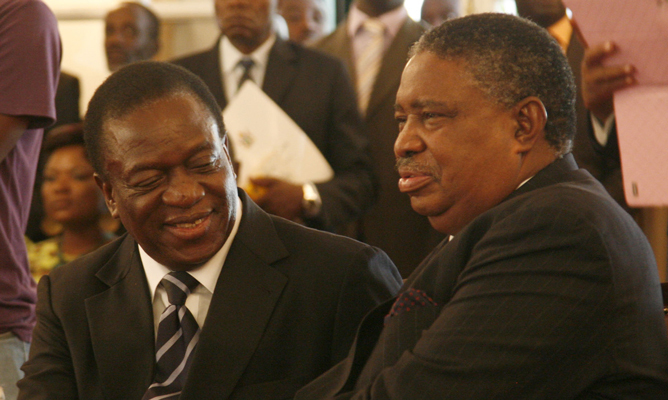 Mnangagwa, who at the time was State Security minister, seemed to pass the buck to President Robert Mugabe, then Defence minister Sydney Sekeramayi and army commanders for the massacres, which were perpetrated by a North Korean-trained army unit, the Fifth Brigade. “How do I become the enforcer during Gukurahundi? We had the President, the Minister of Defence, commander of the army and I was none of that. My own enemies attack me left and right and that is what you are buying,” he is quoted as having said. The late General Solomon Mujuru was army commander, while current Airforce of Zimbabwe Commander, Perrance Shiri was Fifth Brigade commander. Mnangagwa was the State Security minister then and is often regarded as the face of the massacres. A recent book by former Education minister, David Coltart also reveals the extent of Mnangagwa’s involvement and alleged hate speech utterances. In the interview, Mnangagwa also denied leading the Team Lacoste faction or harbouring ambitions to succeed Mugabe. “I don’t see myself doing that … I was not serving to be President. I was serving my country,” he said. Mnangagwa scoffed at those praying for Mugabe’s death, as the only leader Zimbabwe has known since independence turns 93 next February. “Under British constitutional law, you don’t conceive or desire the demise of Your Majesty. Why would you want to conceive or desire the demise of my President,” he reportedly said. War veterans’ leader, Chistopher Mutsvangwa has insisted that Mugabe should step down and pave way for a new leader. “We need to have a new look at the management of the economy … since he (Mugabe) is the elected President, he has to either deliver on that or make it possible for someone else to deliver on it. We would hope it’s the latter,” he told the magazine. Coltart also seemed to endorse a Mnangagwa presidency, saying the Vice-President is business savvy and understands what needs to be done to save the ailing Zimbabwean economy suffering from a blistering liquidity crisis.